Timothée Chalamet has been winning hearts and minds (and a lot of awards) all over the world thanks to his performances in Lady Bird and Call Me By Your Name. Here's everything you need to know about the star including his age, net worth, relationships and films. 1. How old is Timothée Chalamet? Timothée was born December 27, 1995, making him 22-years-old. The actors, who were both nominated for Golden Globes, attended LaGuardia High School of Music & Art and Performing Arts together in New York. 4. Tyler, The Creator referenced Timothée Chalamet on his song 'Okra'. The Odd Future rapper released a stand-alone track called 'Okra' which included the line: “Tell Tim Chalamet to come get at me / Skin glowin’, clear of acne”. Timothée responded by retweeting a meme of himself falling off a chair in response to hearing his name. We'll assume he liked it then. He played the young version of Casey Affleck's character Tom, who is described as "simple-minded child who attempts to take care of the family". 11. Timothée is winning all the awards for his role in Call Me By Your Name. Timothée plays seventeen year-old Elio who begins a relationship with Oliver, his father's research assistant, played by Armie Hammer, with whom he bonds over his emerging sexuality. 12. Timothée learned Italian especially for the film. 14. Is Timothée Chalamet dating Lily Rose Depp? We hate to break your heart but we believe Timothée and Lily are indeed dating. The were photographed sharing a kiss in the rain in October 2018 and other photos have emerged of them hanging out together. 17. How tall is Timothée? Timothée is 1.82m tall, which is 5ft 10. Timothée was nominated for Best Actor at the Oscars for his role as Elio in Call Me By Your Name. 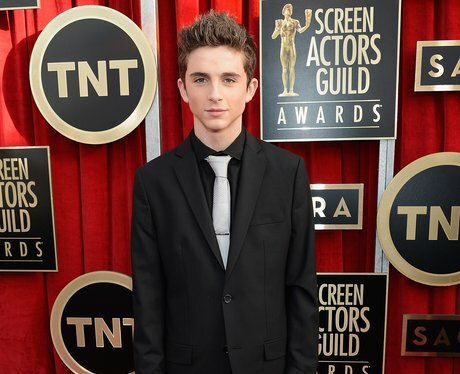 He was the third youngest actor to ever be nominated for the award. Adrien Brody is the current youngest winner for his role in “The Pianist” (2002). Brody was 29 years, 343 days old when he won the award. 21. Timothée Chalamet wore a stunning white tuxedo on the red carpet at the Oscars 2018. Alas, he might not have scooped the Best Actor award at the Oscars but he did get heads turning on the red carpet by turning up in a fitted white tuxedo and bow tie from Berluti. A surprise video shoutout from "Mr. Shifman", Timothée's old drama teacher, had the actor tearing up and smiling during an interview on the red carpet with ABC news too. Awww! He may have won the Best Actor award but that didn't stop the hosts, Nick Kroll and John Mulaney, making a joke about his outfit. Commenting on the over-sized white shirt Timothée was wearing, Nick said during the opening monologue: "Timothée, thanks for taking a break from the gas station." LOL! The brand of the shirt is Off-white. It isn't currently listed on their website but most of their shirts are in the $300-700 price range. The film is described as "two young people arrive in New York to spend a weekend; once they arrive they are met with bad weather and a series of adventures." However it's now not certain whether the film will happen at all due to the backlash to the film's director Woody Allen. Chalamet said in an Instagram post he cannot answer questions about his choice to work with Allen due to contractual obligations. However he followed that with, "I don't want to profit from my work on the film, and to that end, I am going to donate my entire salary to three charities: TIME'S UP, The LGBT Center in New York, and RAINN." Good lad. 26. Timothée set to play a meth addict in 'Beautiful Boy' with Steve Carrell. The film chronicles meth addiction and recovery through the eyes of a father (Steve Carell) who watches his son Nic (Timothée Chalamet) as he struggles with the disease. The trailer will drop tomorrow (June 28) and the film is set to be released in October/November 2018.